Simple things can become extraordinary in the hands of a good cook. 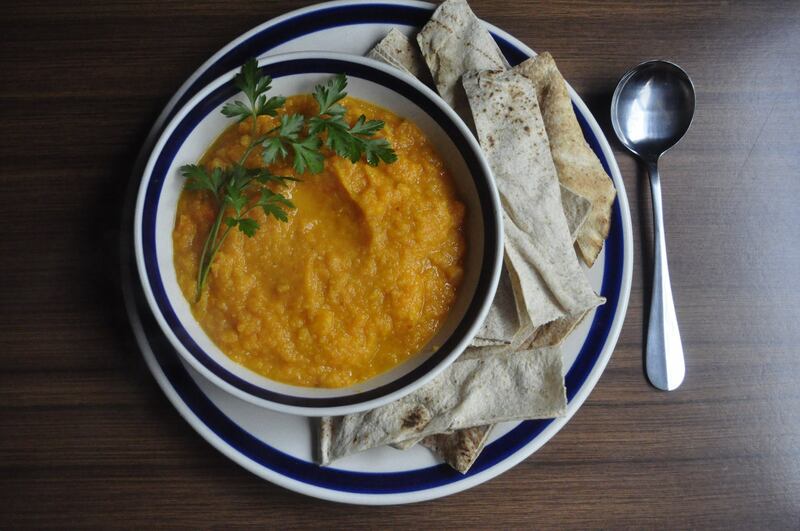 So I was excited when my friend Kristen from The Granny Square Conspiracy, a talented cook and even more talented photographer, shared her recipe for Moroccan carrot soup. This recipe makes use of ugly carrots. Yes, ugly carrots. Well, actually technically they are called crazy carrots. 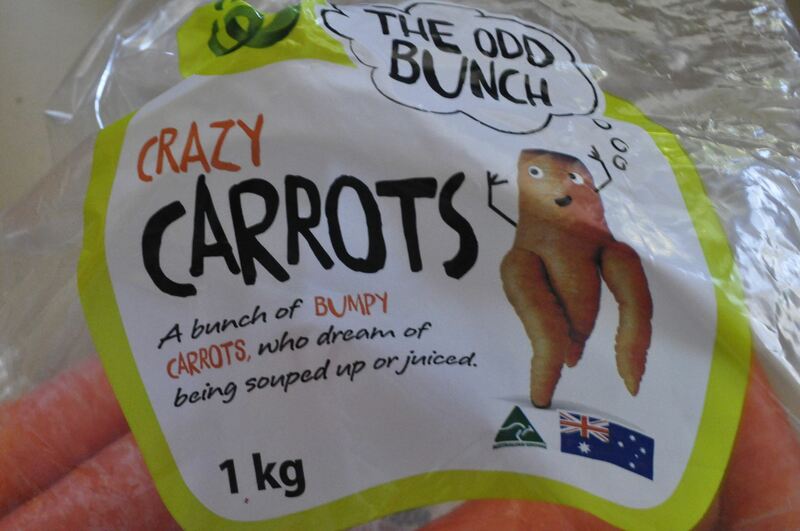 Crazy carrots are part of an odd bunch initiative by Woolworths to sell produce that is less than perfect. Up to 25% of fruit and vegetables are wasted because they are not perfect enough to meet exactly supermarket standards. Woolworths is seeking to counteract this by selling blemished or odd shaped fruit and vege at a discount. Once you cut up and boil these ugly carrots, they are absolutely no different to normal carrots. And try them in this soup – it is a lovely, rich flavour combination and I am sure you will be pleasantly surprised. Dice and fry the onion with the garlic in a big pot. 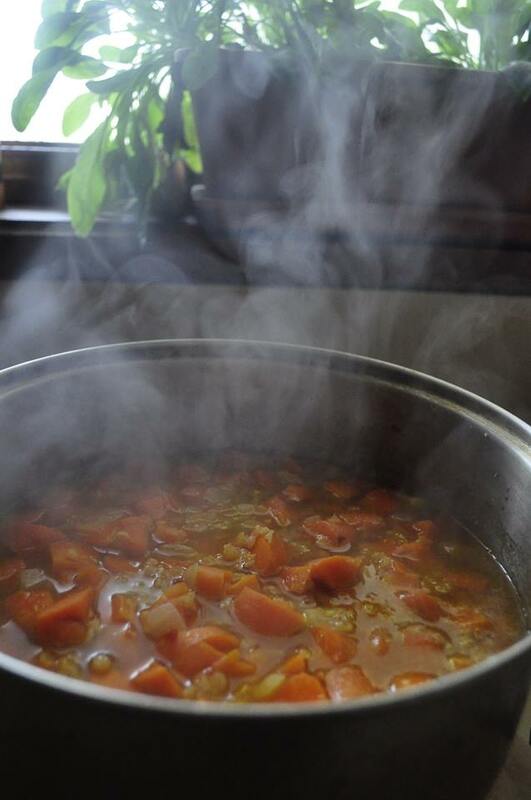 Dice the carrots (be as rough as you like – the whole thing will be blended), add the carrots and lentils to the pot, cover with just enough water (you can always add more later if you like it thinner), add the spices and stock. Let is simmer for about 10 mins until the carrots are soft. Then use a bar mix to blend it in the pot. Notes from Kristen: I cut up the Lebanese bread and grill it for a couple of minutes and serve the with sour cream, pepper, a few more chili flakes and the bread. It’s a huge meal – could easily serve 5 as a main. And it takes less than 30 mins to make, most of the time is in chopping. It’s such a pity to throw out the carrots just because they are ugly! So this meal is easy, fast, cheap, healthy, vegan and ethical too. Hope you enjoy it and it keeps you warm! I have been working on a spiced carrot soup. I love the addition of lentils. Look forward to reading about your own spiced carrot soup. I think this is a bit of a winner. 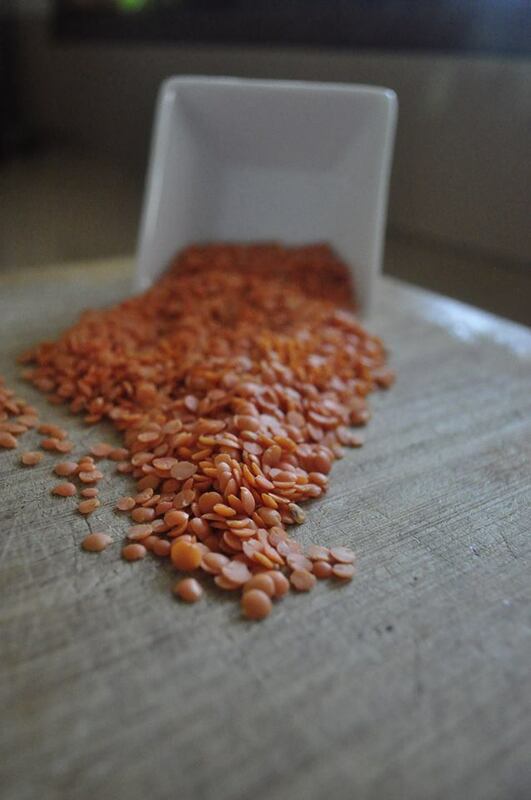 I like orange lentils, super healthy, taste good and easy on the wallet. I’m always on the hunt for different but quick as quick meal ideas for midweek dinners and this fits the bill. On the plus side… veg intake! and leftovers for work lunches. Thank you. And yes, good ideas for midweek meatless (and quick) meals are a lifeline.